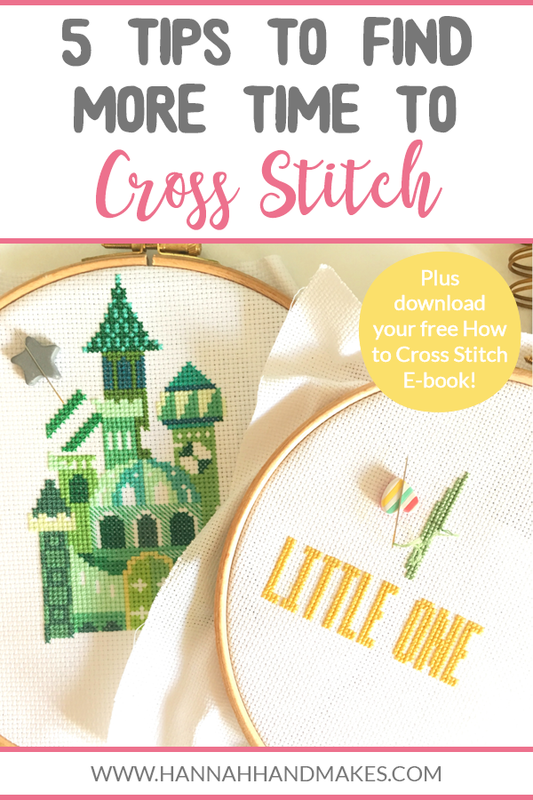 In this episode, I give you 5 actionable tips to find more time to cross stitch and be creative, and I share the first pattern of the series. No time to read the whole post now? Scroll to the bottom to pin for later! *Affiliate link. I only ever recommend products I use myself. If you purchase through my link I may receive a small commission at no extra cost to you. “I got started in cross stitch when I was around 14 I think when a little club was started at school and they showed us the very basics. We did tiny designs and nothing fancy” [Sounds like my kind of club]. “I’m mostly self-taught, I haven’t done any cross stitch in 14 odd years and picked it back up last year. For me, it’s relaxing and mindless and I like that projects can take a long time to complete, so I can keep coming back to them. Currently, I don’t have time to cross stitch. I have a 2-year-old and our second was born at the end of October so me time is limited. 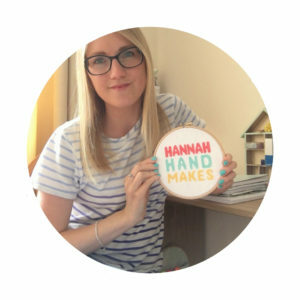 I do try and make time each day ideally for said me time and to do some crafty outlet – so knit, crochet cross stitch etc”. Making more time to be creative is impossible. Everyone has 24 hours in a day and things need to get done, and some things may have to be sacrificed so you can be creative. I would much rather be stitching than cooking but unfortunately cooking is a necessity. So instead I watch less TV, I don’t check my phone, I get up a bit earlier etc. It’s important to find the reason why you want to cross stitch before you start sacrificing things as otherwise, you might start to resent stitching. Some of you may need to stitch because it’s your job, others may do it for a hobby. For me, it’s a bit of both. Although I have a business around cross stitch, this isn’t the only reason I do it. I stitch to relax and de-stress. It takes my mind off my busy life and sometimes I have my best ideas while I’m lost in a cross stitch project. And of course, the satisfaction of finishing a piece of work is an amazing feeling. 1. Work on 2 or more projects at the same time. This might seem counter-productive but I promise it helps. I have 1 bigger project that needs my undivided attention, and smaller ones that I can pick up and put down. I save the bigger one for an evening when the kids are in bed and I can sit and stitch with little distraction. 2. Have your smaller projects out at all times. For me, this involves keeping it high up and out of reach of little hands and this is where project bags come in handy. I keep them on windowsills and draws and the kitchen counters and whenever I have a spare 5 minutes I can grab a project out and have a little stitch. 3. Double up some tasks. For example, take your kit into your work and stitch on your breaks or lunch hour. Stitch in the bath, or while you’re standing at the oven cooking – watch out for getting food on it though)! Or maybe the kids are playing happily or you’re watching a film together – take 10 minutes for a bit of stitching. 4. Stitch while you’re commuting. This could be while you’re on the train or bus to work or maybe you’re going on a road trip or flying abroad. 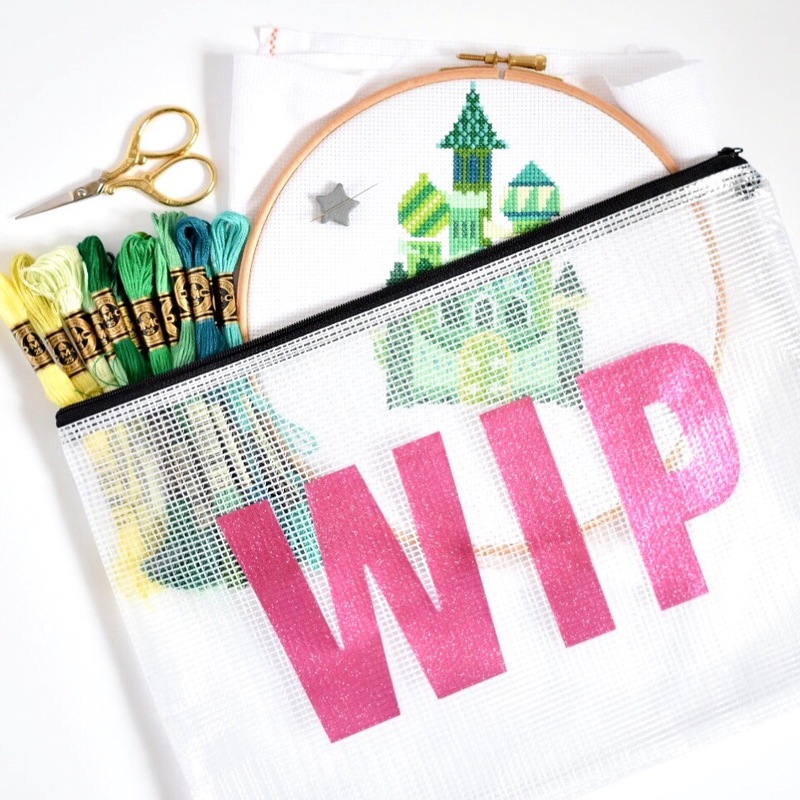 Have your project bag handy and take it with you. Stitching in the car isn’t the easiest but practice makes perfect here. One thing I recommend if you are going to stitch while commuting is to get yourself a portable reading light in case it is dark on your commute. For example, if you are a passenger in a car and you’re travelling at night you won’t be able to see your stitching (speaking from experience here). I recommend this Topelek Read Light from Amazon* which will just clip onto your hoop or frame. This makes it much easier to stitch in those 5-minute gaps and while you’re commuting. For example, stitch the outlines of the pattern first and then you can fill the insides without needing to look at your pattern. Or stitch the whole pattern in half stitches first and then you can go back over them to make the full stitches. Only stitch what you love. If you are not enjoying stitching a project then you won’t be as excited to stitch as you usually are and so you just won’t stitch as much. Think about a book that you really love. When you are deep into it, how hard is it to put that book down to go to bed? If I don’t get all these feels then I put the project down and come back to it. I don’t feel guilty about an unfinished WIP and you shouldn’t either! The productivity-ist in me wants to batch everything including my creativity, and sometimes I do. But when you work at home with at least 1 child there 24/7 this isn’t always possible so I need to stitch in those gaps that I get. And I don’t feel guilty for taking those 5 or 10 minutes anymore because I know after it I will be calmer and happier. The pattern on the month this month is from Yeesam Art and was recommended from Ella in my Facebook group; “My favourite pattern is one you can find on Amazon called Rainbow Bubble Girl*” and even better, it’s actually a full kit. I hope these tips have given you some ideas to help you find some time to get creative. And I would love to know if you have any other tips for how you find the time to cross stitch and craft? Just comment below! Vote and nominate for the National Needle Craft Awards. Join my Facebook group and come and chat with other like-minded cross stitchers.